The Monday through Friday pages can be used in a multitude of ways. I've laminated them and used them as dry erase pages to write homework on and calendar reminders for students. I have printed them in smaller versions for my own organizational purposes. The daily color band (blue, green, yellow, purple & orange) corresponds with other daily activities, such as math centers, I do in my classroom. 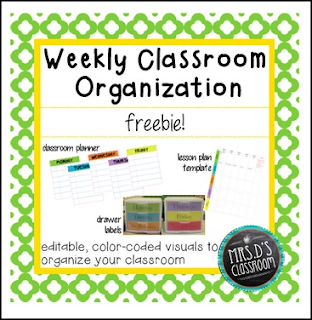 Color-coding is a very easy thing for students and substitutes to follow! Check out the notes I've included for more ideas of how to get yourself (and your students) organized today!